Okay; time for some tough love regarding my gear choices this year. Before I tackle the first one, however, I should be candid about how I am going to evaluate these decisions. Perhaps I’m just a slow learner, but even after lugging fifty or more pounds of gear, food and water over 220 miles, I’m still not convinced that a ten-pound base weight is the right answer for me. 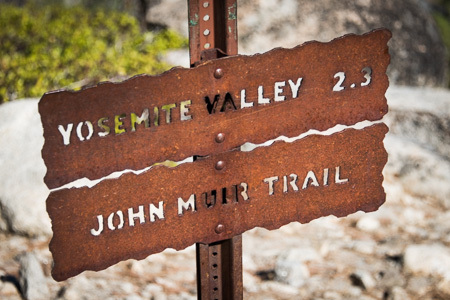 Furthermore, my target audience on this blog is the beginning and intermediate hiker who wants to walk the John Muir Trail. If you are going to bring nothing but the lightest gear possible, and very little of it, you’re going to need to make up that deficit in gear with a surplus of expertise. Neither I, nor the typical reader of this blog, possesses that expertise in ALL areas. A good example of that is water purification. Rangers I’ve talked to, as well as hikers who know the Sierra Nevada very well, often tell me that they don’t purify at all, because they KNOW where the water is safe. I know several places where I’ll drink without purifying (mostly springs where the water is emerging right from the aquifer). But I would never suggest, here, that anyone hike the JMT without a way to purify water. I’m also a believer in a good night’s sleep, in an effective shelter. I’m willing to tolerate some discomfort, but the point is to enjoy myself on the trail, not set some sort of personal deprivation record. So, as I go through each item, remember I am intending to reduce weight, but not at the expense of safety or a minimum of comfort, and I am making recommendations that even a beginner can implement. If you’re going to reduce weight you need to start with the big three: the sleeping system (bag, pad & accessories), shelter, and backpack. In my case those items accounted for more than sixteen pounds. I’m going to venture a guess that there are some ounces that can be shaved there. I’ll start with my sleeping bag. My choice was a 20-degree, down-filled bag, and I can think of no better example to demonstrate how flawed thinking on my part led to too much weight. I will give myself some credit for choosing down. I’ve explored some of the synthetic bags (and the “synthetic down” bags) and I’m still convinced that real down is best. The synthetics tend to be heavier, and people in the know seem to be of the opinion that their performance when wet is not all that much better than with a wet down bag. No one should pack a synthetic down bag without also bringing a waterproof stuff sack to keep it dry. (That seems to especially be true for DriDown.) Real down is still king in my book. Almost every other choice regarding the bag, however, was wrong. First, the rating. I hate being cold in the woods—absolutely hate it! Here’s how I got to the decision to bring a 20-degree bag: the nights are likely to get as cold as 40 degrees on the hike, I tend to be a cold sleeper (subtract 10 degrees) and sleeping bag manufacturers tend to exaggerate their ratings (subtract another 10 degrees). Viola! A 20-degree bag! Ah, no. That analysis assumes you are wearing nothing significant in your sleeping bag; it assumes that it will be 40 degrees for a substantial period of time, and it assumes that there is no downside to having a bag that is too warm. None of those assumptions were true. I think the right answer may be silk-weight, long, underwear. First, one can often cut as much as a pound off the bag weight by going with a 30-degree bag, and the underwear (top and bottom) weighs about ten ounces. That’s a net savings, unless you are carrying the underwear anyway, like I did. Then it’s a gross savings of sixteen ounces. Second, and more important, you vastly increase the range of temperatures where the bag will be comfortable. On most nights I did not put up a tent, and even while sleeping under the stars (and wearing no additional layers in the bag) I was too warm until early morning. On nights that I used a tent I was even warmer, but I’ll cover that later. So, here’s what I may carry the next time around: a 40-degree bag, silk-weight underwear (which I was already carrying), rain jacket and pants (which I was already carrying), and a lightweight, waterproof, stuff sack for the sleeping bag. Weight for bag and sack: 21.5 ounces. (The underwear and rain gear are a push since I already carried those.) With all of that on, inside my bag and inside my tent, I would be comfortable down to 20 degrees quite easily, perhaps even a little more. Spending less is a great idea and I believe is very doable. There are several approaches, and I will cover them in an upcoming post. Keep checking in and thanks for the comment! Good analysis. I had to make the same decisions when I hiked the JMT in 2011. I also chose a 20 degree down bag on the assumption that is was probably only a 30 degree bag. We did have nights that were sub 30’s and I was glad to have the warmer bag. I also used the lightweight silk underwear as my sleeping bag liner and after much experience I believe that it’s the right choice versus carrying an actual liner. Add socks and a beanie and it will shave at least 10 degrees off of the bag temperature thus making a 30 degree bag more like a 20 degree bag. Now almost all good sleeping bags are EN or European Norm rated so in most cases if it says that it’s a 20 degree EN rated bag then it’s probably accurate on average (my 20 degree bag was not EN rated which is why I assumed 30 degrees). If you chose a 20 degree EN Rated bag then yours probably is a 20 degree bag which is why you were too warm sometimes. Also keep in mind that overall this was a very warm year in the Sierras with no snowpack. In 2011 we had almost 200% more snow than usual over the winter and spring so some places were like a refrigerator. All that being said, this summer for the Sierras I chose a 32 degree REI Flash Sleeping bag that is a hybrid with Polartec synthetic fill on the bottom and down on the top. It’s an ingenious idea because the part that is exposed to the ground is synthetic and will dry faster if it gets wet. It also doesn’t compress like down so you have an insulated layer that has some value, with a down quilt on top. And the best news is that in a regular it only weighs 1 lb. 9 oz. and compresses into a very small compression sack. At around $260.00 it’s fairly reasonable too, especially if you have a coupon. I have a 40 degree travel sack as well, but it weighs almost as much as the REI Flash and I would be reluctant to take it to the Sierra’s unless I knew that it was going to be warm or I was not expecting to camp at elevations over 10,000′. I would not risk it on a 2 week trip not being certain of weather conditions. In general, for all purpose three season California backpacking I recommend a 32 degree EN rated bag for men and a 20 degree EN rated women’s sleeping bag for women (there is a difference in EN ratings for men’s and women’s sleeping bags). The 40 degree bag is great for summer and early fall trips into my local mountains (Santa Barbara) for a short one to two day trip. I can pack it into a daypack with all of the gear that I need for a short trip and go out ultralight. I would not sleep in my rain gear ever. That would be like sleeping in a sweat box. Thanks, Curt. I agree with almost everything you’ve written; the 32 degree bag you describe sounds terrific. That silk-weight underwear is great stuff–light and really effective. I have to disagree with the sleeping-in-rain-gear part, though. I’ve done that several times on especially cold nights and have never had a problem with sweating in the bag. Second layer on top of the silkies is Smartwool for me. In fact, I usually sleep in the ultralight 150 weight 1/4 zip long sleeve so I can have my arms out of the bag and not feel so confined. If it’s still cold I would put on a down or synthetic fill vest to warm my core temperature. Always a good idea to cover your head, hands and feet if you’re getting cold. This seems to work especially well for women that sleep cold. Your rain gear must breath really well Ray! I’d actually argue that you might even get some heat loss by wearing rain gear because you’re putting a waterproof membrane between you and the loft in the bag. I’ve never tried this though so who knows? Great point re: heads, hands & feet. I have a separate pair of comfy sleeping socks that I use. My rain gear is pricey up top, but bargain trousers. The good stuff above the waist might help. I also made a less than perfect choice for my JMT hike this year. I purchased a Marmot Helium long which I believe weighs in at 38 ounces. It is a down filled 15 degree bag which one would think should be more than adequate. In fact, it was just fine for most of the nights. But on the colder nights, I had to use additional layers because the bag was way too big for me both in length and width. I thought I needed a long since I’m 6’1″ but a regular probably would have been fine. But even then the Helium is a wider bag, probably too wide for me. I’m looking at selling the Helium and buying a zPacks bag for next year but I’m undecided on going with a 30 or 20 degree bag. The zPacks bags are roughly half the weight of the Helium … and probably will be warmer for me since they are cut more narrow. That’s a great point, Ravi. I had the same problem with my rectangular bag (instead of a mummy). At the bottom there was so much open space that when I would shift from side to side my feet would find a cold area in the bag and it would wake me up! Next time, it’s a mummy bag for me. I’ll probably dislike the confining nature of it for a night or two, but I’ll get used to it. I subscribe to the idea that one’s entire suite of clothing can be worn at night with the sleeping bag or quilt. For me, for a summer/early fall hike in the high Sierra, that is 2 long underwear bottoms (silk-weight and expedition weight) plus hiking shorts, and 4 tops (two silk-weight and one expedition weight long underwear, and lightweight down sweater with hood), beanie cap under the hood, and lightweight wool socks. I find that a 30 degree quilt allows proper space around the body whether all these clothes are on, or none are on. I wore all of this at Guitar Lake in mid-Sept and was toasty when it was in the upper 20’s outside and my quilt became wet due to condensation dripping onto it. I also bring a reflective emergency sheet that can be used for excessively cold weather that might occur once every 10 or 20 nights, or when one gets wet. All great thoughts, Fred. I particularly like the comment about the reflective emergency sheet; that’s a very lightweight piece that can provide a margin of error. Love your analysis! I purchased a new bag this summer for my Yosemite hike; a Columbia 32° bag, weighing in at 1lb. 9oz. I snagged the prior year closout for about $150! It was a steal, but I was concerned that it wouldn’t be warm enough when I reached the higher elevations. I sleep in silk and synthetic base layers. While in Vogelsan and Toulumne Meadows, the night time temps dipped into the mid to low 30’s and I brought additional layers into my tent so I could layer up if I got too cold. Well, it never did!! I’m glad I made the choice based on the weight and skipped the bag with the colder rating. Thanks, Dana. It sounds like you are a couple of steps ahead of me. I’m glad it worked out. Great price, too! A lot depends on what time of year you are in the Sierra. I’m a late July, August and September kind of guy (because I hate dealing with mosquitoes). Until you get to the latter part of September, and if you are at 11,000 feet or lower, sub-freezing weather is unusual (although far from impossible). Anyway, I guess my point is there seems to be huge variability in the comfort range for different people. And I have a question: how is it that one can be simultaneously chilly and clammy (damp, almost sweaty) at night? I’ve experienced this my whole camping life, regardless of cowboy vs tent, sleep system, teens to late middle age! Thanks for the comment, Dana. You are absolutely right when it comes to variability. Age, body fat, metabolism–even if you ate hot food for dinner–all play a role. As for your chilly AND clammy paradox, I assume that is because the moisture comes from condensation (even if you camp outside of a tent), not from perspiration. I have used a WM Highlite before on the JMT and it is rated for around 35 degrees, and I sold it! I would not recommend a 40 degree bag for this trail unless you are only camping in the lowest valleys. WM has some of the best and accurate sleeping bag ratings, so trusting other bags rated at 40 degrees is a recipe for cold nights on the JMT. I have found the ‘sweet spot’ to be a 30 degree bag with thin layers to sleep in. I agree with the previous poster on wearing rain gear and sweating too much. I know some people like a vapor barrier to help with condensation, but I don’t like the clammy feeling of it myself. Thanks, Robert. With that sort of base weight you surely have mastered your gear choices. One suggestion that I may have stated poorly: I am not suggesting that one wear rain gear in a sleeping bag if doing so will make you so hot that you sweat. If it does, chances are you don’t need to wear it. Note, however, that condensation comes from respiration. Most folks do not breathe into their sleeping bag, so there should be no condensation. Thanks for getting a good thought-provoking topic started Ray! I also appreciate your thoughtful replies. I have to question a couple of topics though. One is the fact your body sweat doesn’t contribute to condensation. This is simply not true. There was a great article on BPL on this topic, and while a large part of water vapor created inside a tent is from your breath, a lot is being produced by your body as well. If you sleep in just your sleeping bag or a Bivy sack, the moisture expelled from sweat can be a MAJOR issue contributing to condensation inside your sleeping bag or bivy bag, depending on whichever surface is exposed to the cooler outside air. It is a particular problem in the foot box of most sleeping bags because you have no way of venting that moisture out and it stays trapped in the foot box. The other issue is sticking to gear that fits your target audience of ‘inexperienced’ or ‘new backpackers’ and using a technique frequented by UL’s. I agree with you on making things do double duty such as clothes for adding to a sleeping bags temp rating. Where I think there is potential for trouble with new backpackers using this method, is if they go out and purchase a 40 degree bag and try it the first time, the chances are pretty high they’re going to freeze their biscuits off on the JMT if they camp anywhere above 9,000′. I am an average to warm sleeper and have tried using 2 different well known brand sleeping bags rated for 35 degrees, ( Western Mountaineering, Montbell ), and I won’t use them again for a JMT trip! I now have a WM Summerlite and it seems to be just at that sweet spot of lightweight vs warmth ratio for me. I can visualize a new backpacker picking up a random 40 degree down bag on sale at REI and not realize that ratings are notoriously overblown on sleeping bags, and finding themselves very cold. Hey Ray, I really enjoy your post. In 2010 I did the JMT pack weight over 50lbs, I had a very hard time to say the least. I’ve redone my equipment and in 2012 I did the hike again. When I left Happy Isles my pack with food and water was 21lbs. I use a 20 degree bag 1lb15oz made by Feathered Friends with silk long johns. On warmer nights I just use it like a quilt. Wow. Twenty degrees and less than two pounds. Sweet! Don’t forget about quilts. I use a Nunatack quilt. It’s very easy to cool it down, just shake the quilt like you would your coverings at home. If it’s really cold, tighten it down into a mummy. It has no hood, which I hate anyways. This is where a hooded piece of clothing is handy. Even better use a beanie. I got a synthetic super-thin and light beanie from REI which is magnificently warm. I agree completely. This was my first season using a quilt, and I’m a convert–I’m never going back to mummy bags unless I’m looking at sub-0 temps. My quilt is rated around 25 degrees (a 30 degree quilt with 1 oz of overstuff down), weighs about 22.5 oz, and I feel is more versatile than mummy bags. I can vent it easily when I’m hot, and cinch it down when I’m cold. Best of all, it attaches to my sleeping pad, so if I toss and turn, I don’t have to yank the hood on the mummy bag around with me, or worry about my pad sliding around underneath me. As a bivy user, this is especially appreciated! This was fine for the JMT this August/September, although on the last two nights (Center Basin Creek crossing, and Guitar Lake), I was a little chilly in early morning. But, I’m a cold sleeper–I don’t think my 21 degree Rab mummy bag that I used previously would have kept me any warmer. The sleep system is what I actually find to be one of the most difficult portions of gear to get dialed in. I have a bunch of bags for just this reason. I have a 32 bag, that even with medium weight base layers, is inadequate at 40 degrees, yet another 32 degree bag is hot with no base layer at the same temp. I personally, opt for a little lower temperature bag, and then just use it as a quilt if I am hot, or the temp doesn’t get low. Try the Kelty Cosmic line. Although I personally would not go with a 40 degree bag, they have one that is less than 2 lbs., and a bit over $100. The 20 degree bag is 2 1/2 lbs, same price, depending on where you buy it. I own the 20 degree version, and it’s a really solid bag. But, be forewarned – the 20 degree bag is comparable to an EN rating of 32. That is the one I would go for. First, sleeping in rain gear: I’d never plan on this as the backup warming plan. The times in the Sierras when I’ve regretted my gear choices were when I was hit by a long series of rain during the day. Since my rain gear was wet, there was no way it was going to be inside my sleeping bag. I think getting a very warm down bag is the best first step in weight savings. The one I ended up with is the 20°F bag (REI Igneo at 1 lb 15 oz), but my JMT was fairly late in the year and many of my nights were down to 20°F outside, with several days of rain, and even a little hail and tiny patches of snow falling at the passes, for example when I camped at Wanda Lake just below Muir Pass. Even with the warm-ish down bag, I have some lightweight ways of staying even warmer. A silk bag liner is wonderful, since the silk can be shifted to wrap the part of the body that feels coldest, and at just a few ounces (4+oz, I think) it makes more sense than carrying extra clothing. Where I save weight: First, I’ve been using a solo TarpTent (the Rainbow), which is about as light as you can go if you insist on full coverage against mosquitoes and creepy crawlies at night. My cooking gear is just a light alcohol stove, and with only freezerbag cooking I’m only boiling an average of one cup of water twice a day. For water purification I use tablets (iodine during the day, chlorine dioxide over night) instead of the heavier, but perhaps more appetizing, filters or steripens. And I’ve upgraded to a lighter backpack and sleeping pad than my historic ones; a 3lb GoLite Quest and the wonderful ThermaRest NeoAir XTherm. This got my baseweight down to 24lbs, I think. With a full food and water load I think I was at maybe 35lbs. Great point re: wet rain gear in a down sleeping bag. That would NOT be a good thing. That said, it’s been my experience that when it rains during the day it is often warmer than usual that night. The coldest nights seem to come after the clearer days. Admittedly, that isn’t something that I would want to count on 100% of the time. Lots of folks seem to experience colder nights than I have in August and September. 20 degrees is definitely chilly. Keep me informed, Jill, on how it goes. I intend to do a blog post on MYOG in the future. One advantage of sleeping in all of your clothes, apart from allowing a lighter bag, is that in the morning you are ready to go. No need to hop around in your socks trying to get dressed in the cold. If you do your homework the night before, you just need to put your boots on, stuff your sleeping bag, and off you go. This is a great help if you are trying to start hiking at sunrise, which is essential for those big 20-mile days. I like MLD quick (so does Andrew Surka), because synthetics can be washed on the road. Only con is that synthetics don’t compress as good as down and down is not as water resistant as synthetics, but those lines blur daily as technology progresses.. There are water resistant downs and synthetics are showing up packing smaller and smaller.. Thanks for another great post Ray. I’ve also struggled with sleep system choices, and for me finding a bag roomy enough is almost as important as staying warm. I have wide shoulders and until I got a bag that wasn’t too constricting, I never slept well. The bag that works for me is the Montbell Spiral Hugger UL, available in different temperature ratings. In this bag I can turn from side to side INSIDE the bag, which is a huge benefit to me. So, in addition to temperature rating, sizing a bag properly and evaluating how you sleep (side sleeper, toss and turn, etc) is also important. I went with a long even though I’m 5’11” as the long has a larger girth measurement. For me, the sleep system is the worst place to economize, and my bag is the most expensive piece of gear in my kit. I am intrigued by quilts though, I’ll investigate that further. Thanks for the comment, Tom. I, too, am interested in quilts as a possible solution. More to come! I used a 30 degree mummy bag for the JMT in August 2011 and I found that it was a good choice for me. I like the idea of a quilt, but I’m a side sleeper and change sides periodically during the night. I do use my mummy bag like a quilt when it is warm enough by leaving it unzipped and only putting my feet in the bag. When it gets really cold though, I find it warmer with the bag zipped up – especially when I change sides – no cold air gets in. I was out a few weeks ago at rock creek and we got about an inch of snow on the ground at night. Temps were probably in the 20s. I stayed warm enough by wearing most of the clothes I brought. On my JMT hike this summer, all my gear got wet one evening, and I went to bed very cold, with no tent, in a wet sleeping bag, and no dry clothes, and I quickly started very deep uncontrollable shivering. When I realized I was becoming hypothermic, I drank a cup of hot water, then prepared a hot water bottle, and curled up around that bottle until I warmed up and fell asleep until morning. After this experience, I decided I could sleep in any conditions, with any sleeping bag, as long as I had that hot water bottle. Sleeping outside makes it easy to boil water for drinking or preparing a hot water bottle, without getting out of bed. A hot water bottle is a great idea. Thanks for the comment, Chris. Chris and Ray, a hot water bottle IS a great idea. What kind of bottle did you use, Chris? I’ve done it with Gatorade bottles (20 oz and 32 oz), and, back when I carried them, 1L Nalgenes. I wrap the bottle in with some insulation (extra socks, e.g. ), and that slows down the rate at which the heat is emitted. By morning, it’s still warm–good for drinking to warm up quickly. My first JMT thru hike with my then 20 year old daughter. She is a cold sleeper so I bought her a Mrmot Helium bag. She complained about being cold every night for the first week. I eventually figured out it was pilot error. She didn’t realize the hood had an elastic pull cord. SHe had it completely loose. Once we figured this out she slept VERY warm. That’s a great point, Byron, and a good way to “regulate” the temperature in your bag. I find myself adjusting that cord several times during the night.